Rapid Web Services has recently completed a new website for By-Auction, a collection of member estate agents providing property services and offering properties for sale by auction. 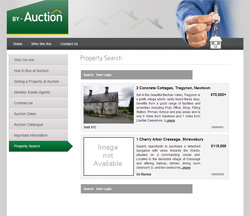 They approached us to develop a site for them that they could use to provide members of the public with tips and advice on selling property at auction, as well links to the member sites, dates of upcoming auctions and auction catalogues. By-Auction asked us to develop the site with WordPress integration and to apply a custom design/theme which was created to fit their requirements. ‘Expert Agent’ was also integrated into the site to populate the property listings section of the site automatically.